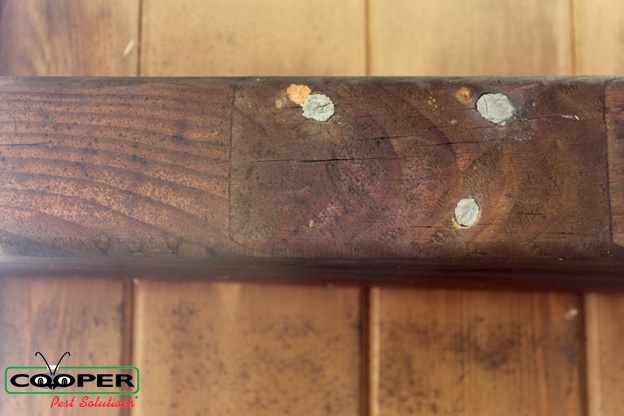 Carpenter bees are responsible for the perfectly round holes drilled into the fascia boards and eaves of your home, as well as porches, decks, and wooden playground equipment. Their size can be intimidating and comparable to a bumble bee, which can be frightening if you don't know what you are looking at. As a homeowner, you should be informed about the dangers are concerning the drilling of carpenter bee holes. Are you seeing carpenter bee damage or carpenter bee activity at your home? Or maybe you want to learn more about how carpenter bee services work. Our library of carpenter bee information will answer your questions. Carpenter Bee removal is now available for online checkout. To conveniently order service at your home, just click the button below. Carpenter Bees vs. Bumble Bees. What's the difference? What's all the buzz about carpenter bees? These bees look like large bumble bees, but unlike bumble bees they have a shiny black abdomen. Carpenter bees also have distinctive flight patterns and are often seen diving and darting about and "chasing" each other in flight. They are solitary bees that make nests by chewing perfectly round tunnels into the wood where they lay 6-8 eggs. Many times there will be a brownish stain on the wood directly beneath their nests. These nests are commonly found along the trim of the roof-line, but they can be found in other places around the house as well. Even though each nest is individual many females will often make their nests in the same general area, and will return every year. Generally, they construct their nests in fascia or in trees. Carpenter bees are simply looking for a place to create their nests. While they prefer natural softwoods that are untreated and unpainted, they can (and will) still nest in the wood used to build and side your house, deck, play set, etc. 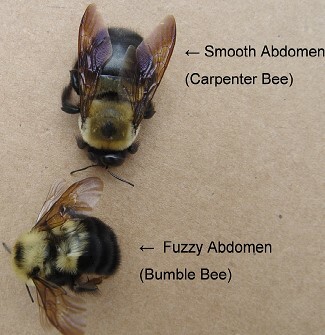 Bumble bees and carpenter bees can often be mistaken for one another, but there is one significant difference in their appearance that will allow you to differentiate the two bees. - Bumble bees have a hairy abdomen that may have some yellow markings. - Carpenter bees have a bare, shiny black abdomen. Along with their difference in appearance, carpenter bees have a very distinct flying pattern. You can see carpenter bees darting and diving around as well as “chasing” each other. Carpenter bees are also primarily solitary bees, whereas bumble bees are social bees that nest together. Unlike bumble bees, who are social bees that will sting to protect their nest, carpenter bees are solitary. Since they are primarily solitary bees, the female carpenter bees will only sting if seriously provoked. Carpenter bees, which are often mistaken for bumble bees due to their similar appearance, are not typically a danger to you, but they can be to your home. They aggressively attack homes, especially along the eaves of roofs where they drill holes and chew into the wood where they build a nest to raise their young. In the fall, new carpenter bees tend to use these tunnels to survive the cold winter increasing the number of bees and the damage they will create the next spring. Once a home gets carpenter bees the issue tends to reoccur each spring. 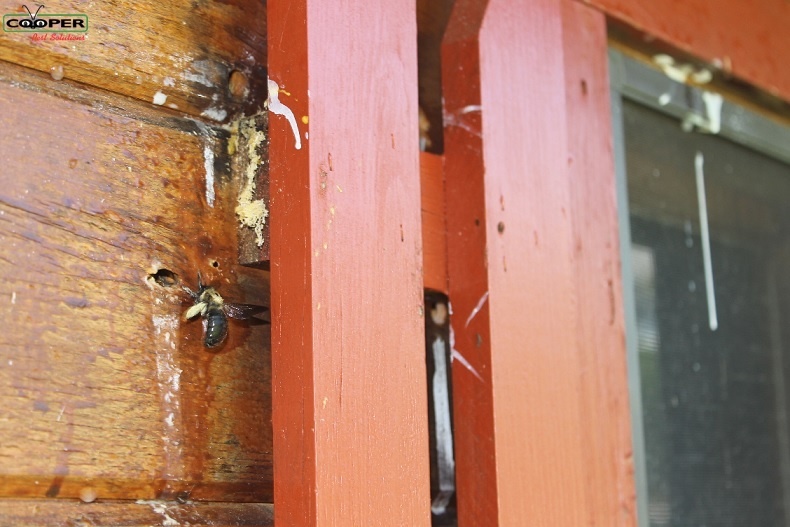 Many of our customers are also seeing woodpecker damage associated with the carpenter bee activity. The woodpeckers create large holes at the surface of the wood to get to the immature carpenter bees developing in the tunnels. WHY CHOOSE COOPER FOR CARPENTER BEE PREVENTION AND CONTROL?